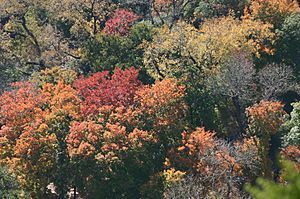 Deciduous means "temporary" or "tending to fall off" (deriving from the Latin word decidere, to fall off). 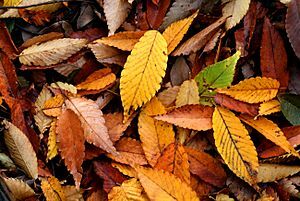 When talking about plants this means that the plant loses its leaves, usually in autumn. The leaves will then grow again in spring. When referring to teeth it means the teeth at the front of the mouth that grow and fall out and are replaced in childhood. They are called deciduous teeth. In botany and horticulture, deciduous plants are trees, shrubs and herbaceous perennials which lose all of their leaves for part of the year. This is called abscission. 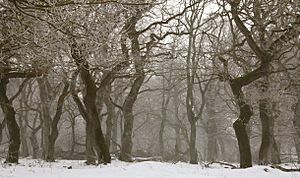 Leaf loss happens in winter in temperate or polar climates. 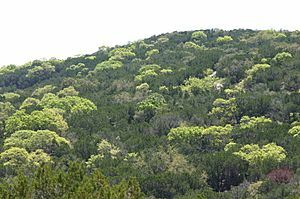 With evergreens, foliage is shed differently from deciduous trees. They seem green year round. Plants that are intermediate may be called semi-deciduous; they lose old foliage as new growth begins. Other plants are semi-evergreen and lose their leaves before the next growing season, keeping some in winter or dry periods. Some trees, including a few species of oak, have desiccated leaves that stay on the tree through winter. These persistent dry leaves are dropped in the spring as new growth begins. Many deciduous plants flower during the period when they are leafless, as this increases the effectiveness of pollination,Also the absence of leaves improves wind transmission of pollen for wind-pollinated plants and increases the visibility of the flowers to insects in insect-pollinated plants. Deciduous Facts for Kids. Kiddle Encyclopedia.